LOGIC Returns to The Fridge! 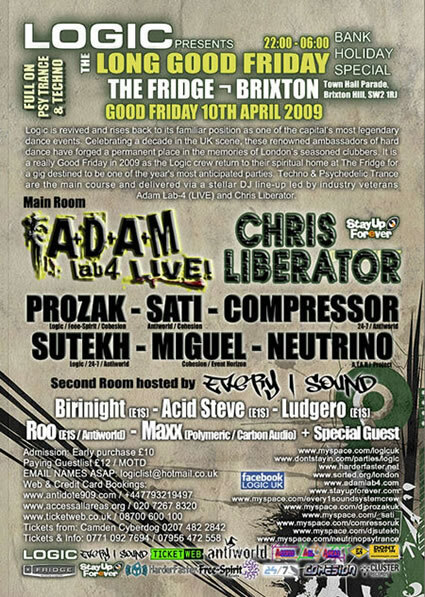 LOGIC present in conjuction with the EVERY1SOUND System a ONE-OFF surprise Bank Holiday Special at The Fridge, Brixton, London on Good Friday 10th April 2009. This is the first LOGIC event to be held in over one and a half years and marks a journey into new musical styles and direction with a full on mesh of Psy Trance, Hard Trance and Acid Techno supported by London's truest and hardest Underground Techno Soundsystem the EVERY1SOUND SYSTEM...In addition to this Logic welcomes two heros of Hard Dance and Techno that need no introduction - ADAM LAB4 debuting his first solo Live performance at LOGIC and the Legend that is CHRIS LIBERATOR himself playing the main room for LOGIC at the Fridge for the very first time. The VERY best crowd this side of the Planet !